In the first quarter of 2016, the Denver office learned of two employees whose family members were fighting cancer. A total of $1,100 was raised for an employee's son who was told his rare cancer was back and there were no other treatments available. The funds helped the family spend quality time together doing things the son wanted to do. The remaining $417 helped an ACM employee quickly head home for a last-minute trip to be at his father's side, who was dying of cancer. In the spring, the Denver underwriting and ACM claim teams raised $815 for REEL Recovery with Penny Wars and Casual Thursdays. 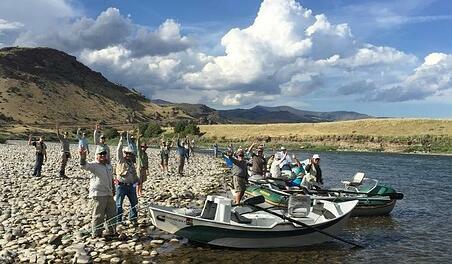 This national nonprofit conducts fly fishing retreats for men living with cancer. Their goal was to send one man to the fly-fishing retreat at a cost of $750, which they surpassed. Way to go, team! 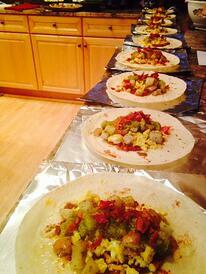 Don't these burritos make you hungry? No wonder their fundraiser was successful! REEL Recovery's cancer victims on a much-needed fishing retreat. Thanks, Team Denver, for your contributions that made it possible! This summer our Colorado coworkers sold breakfast burritos to raise funds for the Children's Heritage Foundation, raising $1,979 that was matched by Arrowhead corporate for a total $3,959. We are proud to be your teammates, Denver!